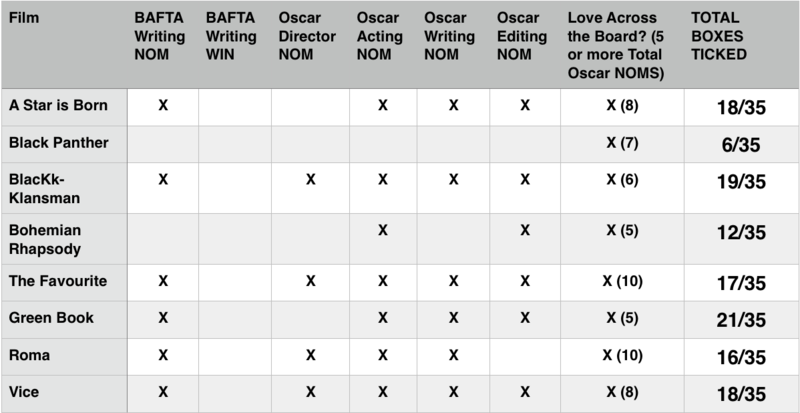 Let’s take a look at the impact of the Oscar nominations on to the 35 boxes league table that catalogues key events on the road to the Academy Awards. Five boxes were up for grabs going to films that got nominations for acting, directing, writing, film editing and love across the board (at least five or more total bids). 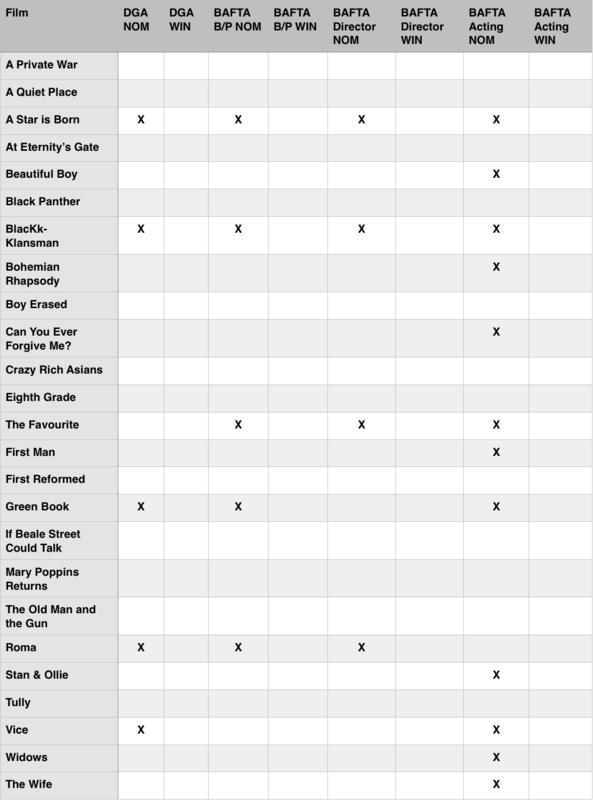 “Green Book,” which got ticks in all boxes bar the directing one after Peter Farrelly‘s snub, is (still) ahead with 21 boxes but has seen its lead narrowed to only two. “BlacKkKlansman,” which has performed consistently over this awards season, is second on 19 after its successful day at the nominations. John David Washington‘s snub doesn’t matter here as Adam Driver was nominated for supporting actor. 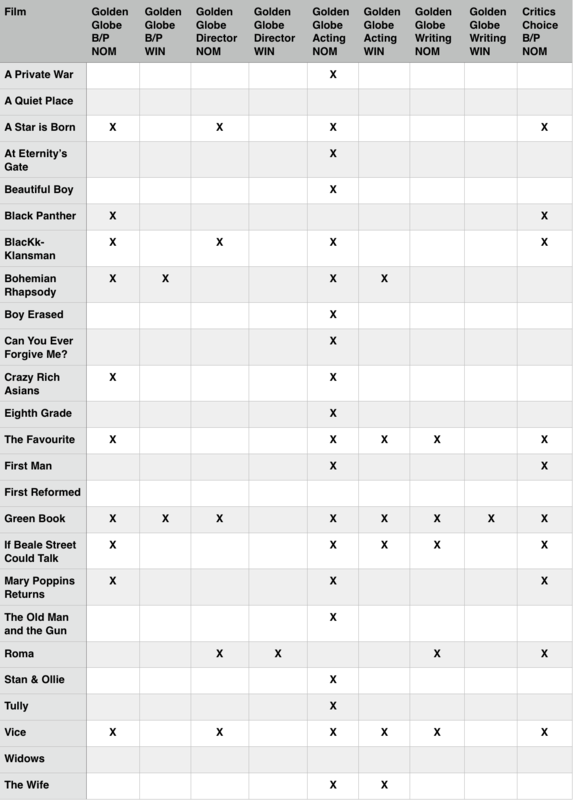 “A Star is Born” disappointed yet again, earning only eight Oscar nominations when we thought it would get 11 and missing out on Best Director for Bradley Cooper (nominations for Cooper in Best Actor, Adapted Screenplay, and Picture aren’t a bad consolation, though, right?). Despite four boxes ticked it drops down to joint third with 18 overall. Joining it there is “Vice,” which got all fives boxes ticked. McKay bagged himself a directing nomination (his second after his first for “The Big Short”) and so “Vice,” too has 18. 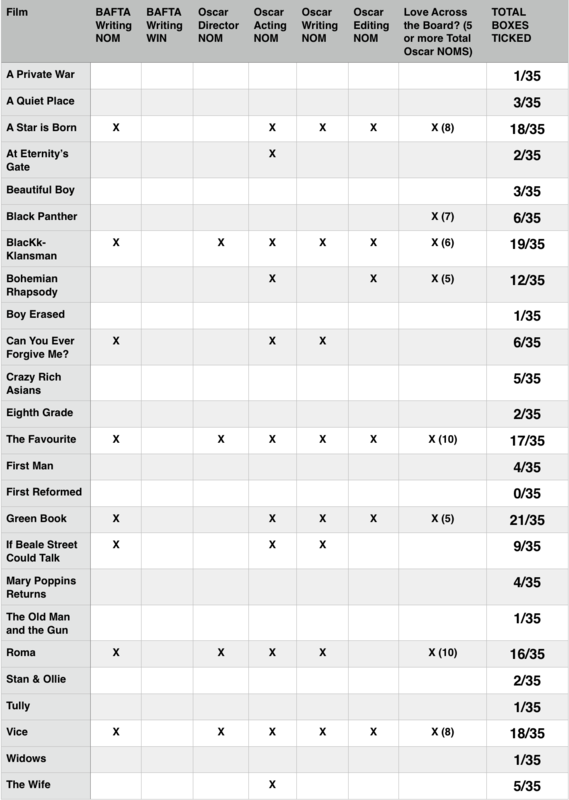 But those two films, although both only three behind the leading “Green Book,” are on very different trajectories. One is going down, the other heading up. Also heading up is “The Favourite,” which scored all five boxes as expected and now has 17 boxes ticked. Just behind is Alfonso Cuaron‘s “Roma” on 16 boxes – though it didn’t do as well here as its’ joint-high 10 Oscar nominations would suggest. It unexpectedly missed out on Best Film Editing, so it only ticks off four out of five boxes here. However, it’s even more surprising nominations for acting gave it a box we weren’t expecting. Swings and roundabouts. In other news, Bryan Singer‘s “Bohemian Rhapsody” scored three out of fives boxes with acting and editing nominations and five total bids, and so moves into double figures with 12. Go them. “Black Panther” sticks out like a sore thumb, here. 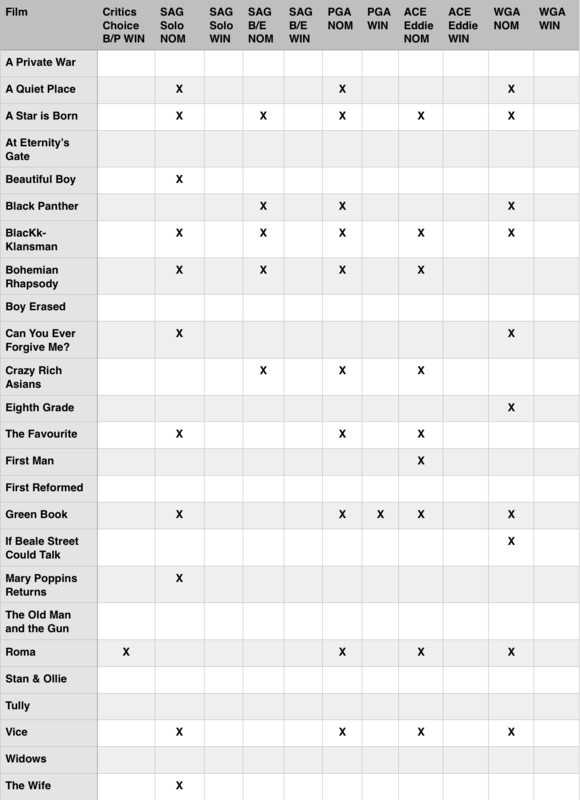 It only has six boxes ticked despite deservedly making history to become the first-ever superhero flick nominated for Best Picture. But this is how it will look from now on. Let’s take a moment to remember our fallen brothers and sisters and think of “If Beale Street Could Talk,” “Can You Ever Forgive Me?,” “First Man,” “The Wife” et al. Tough luck.